Artwork design by Ramon Ramirez. The work is part of the Metro Through the Eyes of Artists poster series, which commissions local artists to create original artworks that express the uniqueness of Los Angeles County neighborhoods, as a way of encouraging people to take Metro to explore new destinations. Four artists have designed new posters for the Metro Through the Eyes of Artists series highlighting Metro accessible destinations. 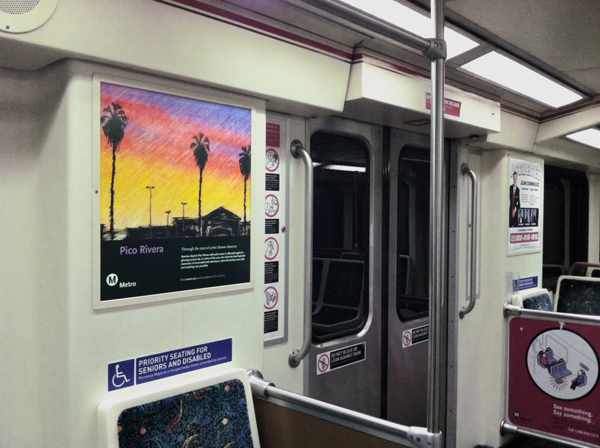 In the conversation below, one of the artists, Ramon Ramirez, discusses his original artwork celebrating Pico Rivera and what he hopes to share with transit riders who see the poster on Metro buses and trains in the coming months. Now in its tenth year, the Through the Eyes of Artists poster series commissions local artists to create original artworks that express the uniqueness of Los Angeles County neighborhoods, as a way of encouraging people to take Metro to explore destinations served by the agency. The four new posters will bring the series to a total of 29 neighborhoods featured. Explore Through the Eyes of Artists posters. 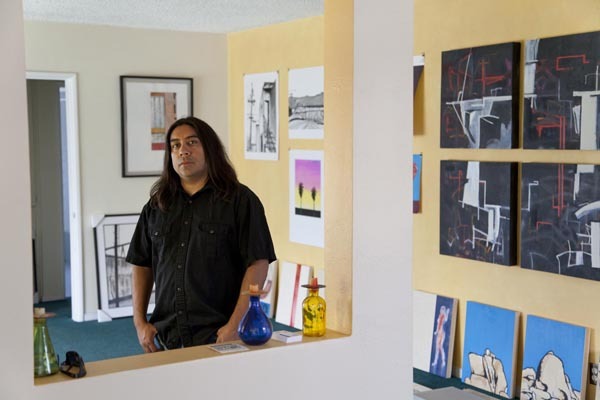 Ramon Ramirez in his Pico Rivera studio. His poster design is visible pinned to the wall behind him. You live and work in the Pico Rivera area—how did you choose this imagery to represent the city? I grew up in East L.A., and after attending college in the Bay Area, where I studied art and architecture, I moved to Pico Rivera. I paint from memory based on what I see. For my poster on Pico Rivera I wanted to focus on Whittier Boulevard because it bridges the city of Whittier, East L.A. and downtown. The downtown skyline was always present in the visual landscape of my childhood. As a kid I spent a lot of time on Whittier, going to movies and other shops with my family. The poster pictures a commercial stretch that evokes the boulevard, but could also be a similar street in another L.A. neighborhood. I want the viewer to experience that kind of familiarity. What distinguishes your poster artwork from other images of Southern California that include palm trees and sunsets? I wanted to show that Pico Rivera is L.A. and that L.A. is Pico Rivera. I obscured the buildings to convey that they could be in other parts of L.A. Palm trees are all over the area, not just at the beach or in Beverly Hills. Sunsets create beautiful silhouettes whether one is at the beach or in a bustling commercial corridor. The scene deliberately shows palm trees but not the beach. I love the beach but I wanted to paint my reality, my side of town. Introduce the novice to Pico Rivera—what defines the experience of living there? Pico Rivera is just like ‘your’ hometown. It’s a community with parks, sports, shopping, movies, swimming, coffee, etc. And my neighbors are awesome. Tell me about your artistic practice more generally (materials, themes, ideas). I’m a painter and I use oil, acrylic, spray paint, wood stain, etc. My work is urban based, but I wouldn’t call it “street art” which is associated with graffiti. My educational background includes architecture so I’m always looking at the built environment. 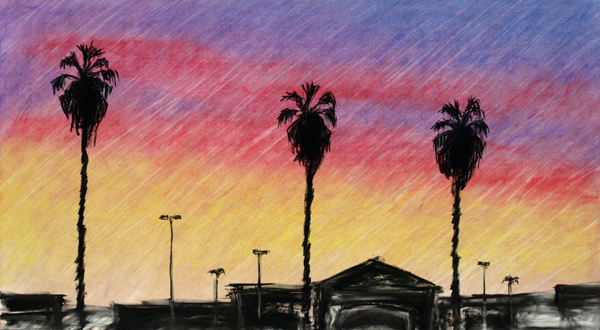 I like painting places like Pico Rivera to show the commonalities of the urban experience. People like to focus on the differences, but I want to show another side of urban living. How do you feel about having your work seen in the public realm of transit? I paint to communicate. Art communicates in different ways and I want to communicate with people visually, emotionally, without their having to read text on a page. With the Metro commuter in mind, my hope is that they’ll see my poster and it will put them in a good mood. I hope that my art will bridge different communities in L.A. by showing them the commonalities that we share. I want to remind them of home. What is your experience (or not) of taking public transit in Los Angeles County? Do you have any good stories? I have fond memories of taking the bus to museums as a child. My mother would take me to LACMA (Los Angeles County Museum of Art), Universal Studios, Children’s Museum and other destinations. When I lived in San Francisco, I would look forward to reading poetry displayed inside the bus. I have to wonder if all those trips collectively had an influence on my becoming an artist. As a result of those museum adventures I’ve always associated taking transit with going on a fun trip. I’m continuing that tradition with my son, taking him to hockey and basketball games at Staples Center in downtown L.A. I enjoyed reading about what inspired Mr. Ramirez. His art is beautiful and so is his story! Thanks for sharing this wonderful idea. I am an artist myself and have always enjoyed looking at the art of others. Thank you! You know, I see his painting riding the green line home every day and I’ve loved it from day one. The beautiful multi-hued sunset looks absolutely stunning. He managed to really convey his message to me and remind me of home. Growing up in South Central LA had amazing scenery, especially the sky. The sunset really does look that way. I love this painting and it’s definately going as my screen saver ha!